Living cells are full of surprises and mysteries. Looking into the genomes of bacterial cells, researchers have discovered an odd paradox: many bacteria make specific toxins that attack their own molecular processes, and at the same time, they make antitoxins that block these toxins. Both the toxin and the antitoxin are typically encoded in a single operon, so they are expressed together, and the antitoxin often additionally acts as a repressor of the operon. Bacterial cells are filled with these toxin-antitoxin pairs. For instance, a typical Escherichia coli cell may have half a dozen different sets and tuberculosis bacteria have at least 57 on their chromosome. So, this is no evolutionary mistake--they are there for a reason. How does an inhibited toxin benefit the life of a bacterial cell? The first toxin-antitoxin pair was discovered in Escherichia coli. The toxin-antitoxin operon was found on a large plasmid that normally occurs in low copy numbers, and its function is to ensure the continued propagation of the plasmid. The trick to this is in the antitoxin. The antitoxins are typically less stable than the toxins and are degraded by cellular proteases more quickly than the toxins. When a cell divides, each daughter ideally gets a copy of the plasmid along with a bunch of toxin-antitoxin complexes. If, however, one daughter doesn't get a copy of the plasmid, the leftover antitoxins are eventually degraded, releasing active toxin that destroys the cell. This drastic approach to quality control has been termed "plasmid addiction." Toxin-antitoxin pairs are also widely found in bacterial chromosomes. Their function is not as well defined, but they are thought to be a mechanism to control growth in hard times. When cells are stressed, for instance by starvation or antibiotics, specific proteases are activated that destroy the antitoxins. The toxins then do their job and slow protein synthesis, ultimately arresting the growth of the cell until the trouble has passed. In these cases, the toxins are not deadly to the cell. Instead, they just put the brakes on growth. 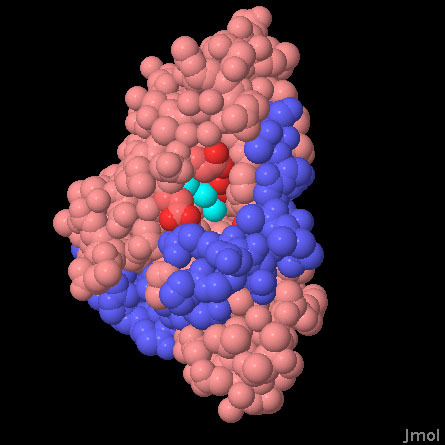 Researchers at ISFI have revealed the first structure of a toxin-antitoxin pair from the bacterium that causes tuberculosis, shown here from PDB entry 3dbo. The toxin and the antitoxin are both small proteins that form an intimate association in the complex. Based on the structure, PSI researchers have proposed that the toxin, shown here in pink, is a ribonuclease that uses magnesium ions to cleave RNA. The presumed active site is in a deep cleft on the surface. 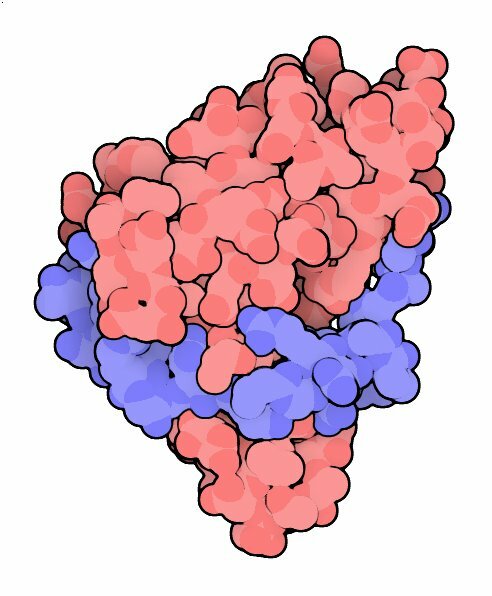 The antitoxin, shown here in blue, wraps nearly all the way around the toxin, blocking the active site. A portion of the antitoxin, which associates with DNA when it acts as a repressor, is not seen in this structure. The critical instability of the antitoxin is easily explained by the structure, since the antitoxin adopts an extended structure that would not be stable in the absence of the toxin. The toxin is shown in pink and the antitoxin is shown in blue. Three water molecules, shown here in turquoise, are bound in the presumed active site, coordinated by a cluster of acidic amino acids, shown here in brighter red. These are thought to be the sites that bind to magnesium in the active enzyme. Use the buttons below to display or hide the antitoxin. Miallau, L., Faller, M., Chiang, J., Arbing, M., Guo, F., Cascio, D. and Eisenberg, D. (2009) Structure and proposed activity of a member of the VapBC family of toxin-antitoxin systems. J. Biol. Chem. 284, 276-283. Makarova, K. S., Wolf, Y. I. and Koonin, E. V. (2009) Comprehensive comparative-genomic analysis of type 2 toxin-antitoxin systems and related mobile stress response systems in prokaryotes. Biology Direct 4:19. Magnuson, R. D. (2007) Hypothetical functions of toxin-antitoxin systems. J. Bacteriol. 189, 6089-6092. Buts, L., Lah, J., Dao-Thi, M. H., Wyns, L. and Loris, R. (2005) Toxin-antitoxin modules as bacterial stress managers. Trends Biochem. Sci. 30, 672-679. Gerdes, K., Christensen, S. K. and Lobner-Olesen (2005) Prokaryotic toxin-antitoxin stress response loci. Nature Rev. Microbio. 3, 371-382.